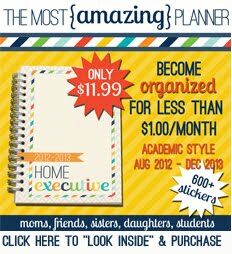 I am all sold out of the 2012-2013 Home Executive Day Planner. However, I have contacted one of my buyers and got them to put their remaining planners online. You can go to the BYU Bookstore to purchase one. If you have any questions please contact me through the "Contact" link in the blue bar above. I wish you all a Happy Holidays and Happy Planning! Thanks for a great year again! 14 comments on "Another place to buy the 2012-2013 planner"
Any ideas on where you can still buy one of these? I couldn't find it through the BYU Bookstore! Thanks! I couldn't find any of the planners either, is there any other way to get one. With a family of 5 I could really use one :) thanks! I would love a calendar too!! Will the BYU Bookstore be getting more in stock?? I really want a planner!! Is there any way to get one! PLEASE HELP!! Thank you so much! So bummed to miss this! Love this! Can't wait to get home next year! If enough of us pre-order, can you run another batch of them? I'd LOVE one and am in dire need of getting more organized! I would absolutely love one of these brilliant organizers as well! Are reading any of these comments, could more be printed? I'd love one!! :( sad you're not doing anymore??!!! Want one too - this seems like the perfect planner!! Get all my posts by email.